Washington Island is the largest of Door County's islands. In 1815, the island was named "Colonel John Miller Island" after the leader of the first white men to set foot on the island. Later settlers changed the name to honor George Washington. Many of those later settlers were from Iceland, and today Washington Island is the oldest Icelandic community in the United States. The island lies northeast of the peninsula just beyond the straits of Death's Door. This name was given to the six-mile-wide passage between Lake Michigan and Green Bay by Native Americans. The name was translated by French explorers as "Porte des Morts" because the treacherous currents and unpredictable wave action claimed war canoes and schooners alike. Today, divers can explore many of the shipwrecks. Ferries from the mainland, with their views of spectacular bluffs and rocky shores, make the crossing of Death's Door a pleasure for today's passengers. Once on the island, many visitors take in its leisurely pace and pastoral beauty while bicycling. Others prefer to take their cars, rent mopeds or take a guided tour. 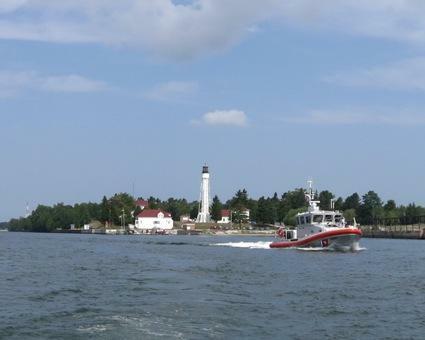 Washington Island offers visitors museums, galleries, full-service marinas, shops, lodging and a golf course.